The Mitsubishi Lancer Evo VIII probably marked the zenith of the Evo cult in the UK. Fast, capable, affordable and selling like hot cakes, the Evo VIII may not have been the best looking of the Evo line - in fact there's a convincing case for it being the ugliest - but it was launched at a time when Mitsubishi was getting its house in order, youngish buyers had a bit of disposable income and track days were becoming very popular. With no shortage of used stock thus available, you shouldn't have difficulty tracking down a decent example. For quite a few buyers, the big story regarding the March 2003 launch of the Mitsubishi Lancer Evo VIII was the fact that it was the very first Evo model to have full UK factory approval. Prior to the VIII, Evos were imported on a bit of a nudge and a wink basis through third parties such as Ralliart and weren't covered by Mitsubishi's normal warranty and servicing deals. The VIII was different. 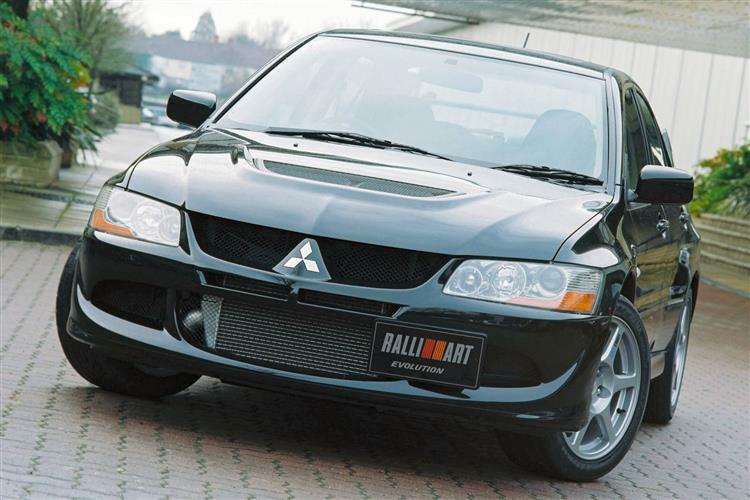 Ralliart was moved in-house, forming an integral part of the Mitsubishi Motors Corporation and Mitsubishi Motors Europe. Mitsubishi Motors UK was the sole importer and prices dropped by around £2,500 model for model compared to the Evo VII as a result. The product offered wasn't hugely different in concept to the Evo VII. It retained a similar shape, there was still the celebrated 2.0-litre 4G63 engine under the bonnet, in this instance offered in two guises, the standard 276bhp model and an uprated FQ-300 version. The biggest changes under the skin were a six-speed manual gearbox, a freer breathing exhaust and the Super AYC yaw controlling differential. There then followed a rapid proliferation in Evo models. The standard car was slightly revised and relaunched as the MR, and an FQ-330 model was introduced. Probably the most interesting move was the development of the £23,999 budget Evo VIII 260 in April 2004, a car that was eventually sold at just £17,999. The FQ-320 then appeared as did probably the most capable Evo VIII of the lot, the FQ-340, with development of this model line culminating in the FQ-400 a car that was both enormously expensive at £46,999 and thoroughly unpleasant to drive on anything other than a track. 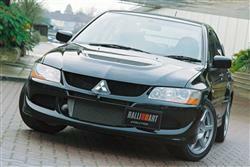 The VIII was replaced by the subtly improved Evo IX in June 2005, that car ditching the beaky front end of the VIII. The entry-level Evo VIII 260 opens proceedings and makes a very capable and desirable first rung on the Lancer ladder. Recognisable by its slightly less overt rear spoiler, the Evo VIII 260 uses the same two-litre 16v engine as the rest of the Lancer Evo range, this time tuned to generate 263bhp and 262lb/ft of torque. As you might expect, this makes it rather brisk, and the top speed of 152mph means that you won't get left behind in a cross continent blast to the Nurburgring. Most of the Lancer driver aids are featured, including Active Yaw Control, anti lock brakes and electronic brakeforce distribution, although the sophisticated Active Centre Differential is reserved for the next model in the range, the Evo VIII MR FQ. 'Mitsubishi Racing' is a logo seen on certain Japanese market high-performance models and the Evolution VIII MR represents the centrepiece of the Lancer line up. Forged alloy wheels reduce unsprung weight and an aluminium roof panel lowers the centre of gravity. Weight was also taken out of the car's suspension system to make it even lighter on its feet. The engine was tuned to offer stronger performance near the redline with competition use in mind. A full-size rear spoiler and suede Recaro full bucket front seats are fitted as standard, as is a carbon finish dashboard and black headlamp reflectors. The 300bhp Evo VIII MR FQ also features Bilstein suspension and distinctive MR badging. Of course, the MR is a ridiculously quick road car. There are those, however, who feel that ridiculously quick merely represents a good starting point. The MR FQ-320 model with over 320bhp was developed by Mitsubishi Ralliart Europe and in this case the company tweaked and massaged the electronics to produce that big power output. This, coupled with the fact that the FQ-320 weighs only marginally more than a bug's buttock, endows it with quite astonishing acceleration. It's worth saving a little extra if you can for the quite brilliant FQ-340. The FQ-400 is overkill, offering a little more straight line speed, Ralliart aero mirrors, a carbon fibre front lip spoiler, gloss black Team Dynamics alloys and red FQ-400 badging. Pride of place has to go to a refinement with possibly the most ludicrous name in the entire motoring industry. If you can come up with a performance enhancement that revels in a more fantastic name than the 'shark's tooth rear vortex generator' then I'd love to hear from you. Ostensibly a set of plastic teeth attached to the trailing edge of the roof, these serve to break up the airflow to reduce rear drag. At least that's the theory. These became an aftermarket favourite merely due to the fact that they made your car look that little bit gnarlier. They even appeared on the Evo IX. The development of the Evo species can most easily be appreciated from behind the chunky Momo steering wheel. The dash has some neat almost Focus-like angles to it, and the plastics quality is now a bit happier than the Happy Meal toy standard of some earlier Evos. The Evo VIII is a tough car and better screwed together than earlier Evo models. The interior is especially well built and suffers from far fewer of the squeaks, twitters and rattles that plague Evos V and VI. Despite the standard versions boasting between 276 and 400bhp, the engine is untemperamental and has yet to develop any significant faults. Tyre bills can be massive, as the Evo rewards an unsophisticated 'chuck and drift' style of cornering. Likewise, it would be prudent to check the suspension and also to have a good look for any signs of crash repair. The key thing to look out for is that the car is what it purports to be. Mitsubishi concedes that some Evo VIII variants can easily morph into others with a bit of judicious chipping and a few cosmetic changes if the owner knows what he or she is doing. There are budget Evo 260s that have been tuned, had a high wing slapped on the back, some aftermarket alloys put on and are being passed off as FQ-300s. Look for aftermarket fuel cuts or cable ties around the turbo hoses to stop them expanding. These are signs that the owner is looking to 'overclock' the turbo boost. If you're looking at an import car, make sure it's been undersealed, that the rear foglight has been correctly fitted, the 112mph speed restrictor removed and that the speedometer and odometer have been converted to read in mph. Look for accident damage such as misaligned panels and paint overspray and ask whether the owner has fitted the aftermarket fix to the Recaro seats that stops them slowly reclining over time. Also make sure that the car has been serviced at an authorised dealer as the Super AYC system requires an expensive proprietary diagnostic tool known as a MUT-II. Your local spanner monkey will not have one. (approx based on a 2004 Evo VIII MR) There's no getting away from the fact that the Lancer Evo VIII is a very expensive car to run. It requires frequent servicing which arrive at the 1,000, 4,500, 9,000, 18,000 and 45,000 mile marks. All things being otherwise hunky dory, the 9,000 mile service will come to around £275, the 18,000 mile service £350 and the 45,000 mile job £780. This excludes the cost of consumables such as tyres, brake discs, clutch kits and brake pads. Factor this in on top of a hefty insurance premium and a stiff thirst and you'll appreciate that despite being an otherwise unassuming four-door two-litre Japanese saloon, the Lancer Evo VII will probably cost more to keep on the road than a Porsche Boxster. With the exception of the FQ-400, all Lancer Evo VIII models drive in much the same manner with variations in just how short a time it takes to get from A to B. It's not a car rich in subtlety. It does not possess layers of talent that must be probed and explored before you see the point. Drop down into the Recaro seats, shut the tinny door and fire up the engine and you'll probably realise what the Evo's all about in the first 200 metres. There are table football games with less direct actions than the short throw gearbox, and the steering feels similarly hardwired. Although there are only two turns from lock to lock, the car never feels nervous or skittish, instead the wheel engenders a disdainful approach to corners. Perhaps disdain is too mild. The Lancer Evo VIII beats corners into whimpering submission, seeing them as an opportunity to carve the shoulders off its big Yokohama tyres and to pump the driver chock full of feel-good endorphins. Understeer rarely figures in the Evo VIII's vocabulary, the steering holding a line with dogged determination. Find a safe enough place to explore the handling envelope and the Evo will astound with its sheer grip. At the extreme margins, it will run wide with all four wheels drifting together, the Super AYC directing the drive to whichever corner the car's brain thinks most capable of deploying it. Unlike the systems in a Nissan Skyline which let give you a margin of heroic oversteer to play with, the Mitsubishi prefers to corner all of a piece, perhaps limiting its appeal to those who seek ultimate entertainment from a car. Only genuinely furious driving will unsettle the rear end. Nudge the gear stick into first, dial around 4,000 revs onto the clock and sidestep the clutch and you can fire an FQ-320 to 60mph in around 4.6 seconds. Naturally you'll need minimal mechanical sympathy to recreate these figures but even in everyday situations the Mitsubishi is quite devastatingly quick. There is a slight hiatus as the turbocharger spools up, but keep the engine on song and it's almost as if somebody has switched the scenery to fast forward. So incongruous is the rate at which this souped-up saloon gathers speed that you'll find yourself laughing in disbelief as the speedometer piles on ever bigger numbers. It'll keep on going until it reaches 157mph but high speed cruising isn't the Evo's forte, preferring instead to squirt out of tight corners and maul roundabouts at scarcely credible velocities. The FQ-400 merits special mention. Although it will accelerate from 0-60 in 3,5 seconds, you'll need to be right on top of your game to drive it. With enormous turbo lag and quite the most hateful clutch action of any production car, it's an expensively acquired taste. In 90 per cent of real world scenarios, the Evo VIII FQ-340 will be as fast or faster. Two models stand out as plum picks here. First up is the entry-level Evo VIII 260. Shunned at first by Evo die-hards as a Mickey Mouse model, it's nevertheless quick, capable, relatively inexpensive to pick up and looks a little subtler than its bewinged brethren. If you're going to go large, best look at the greatest iteration of the Evo VIII development, the FQ-340. Both these cars get a solid five-star rating. Just make sure you find one that's as honest as it purports.